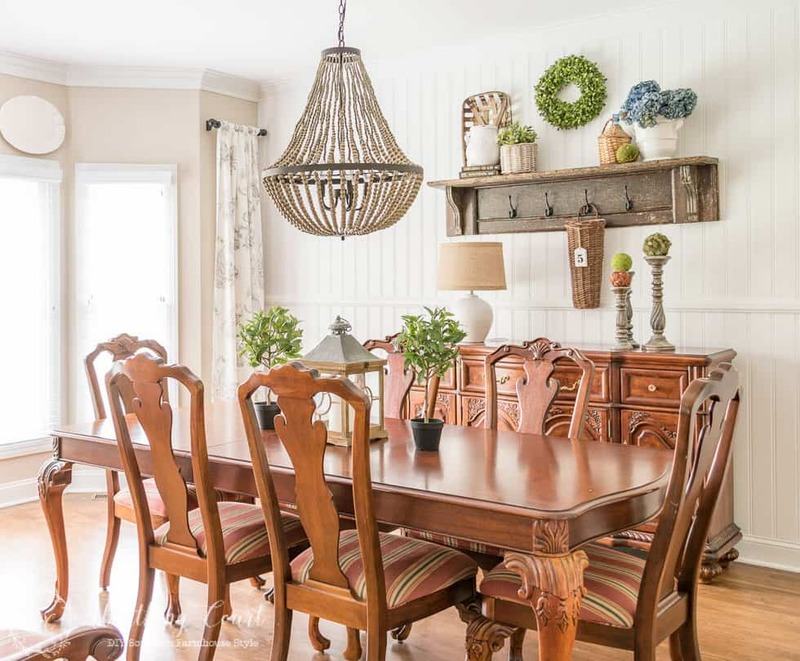 I’m back today to share more of the progress that I’ve made in our dining room makeover. So far, the changes have been pretty easy because I already knew what I wanted to do. Now, I’m getting into decision making territory and it has me a little ‘skeered’. 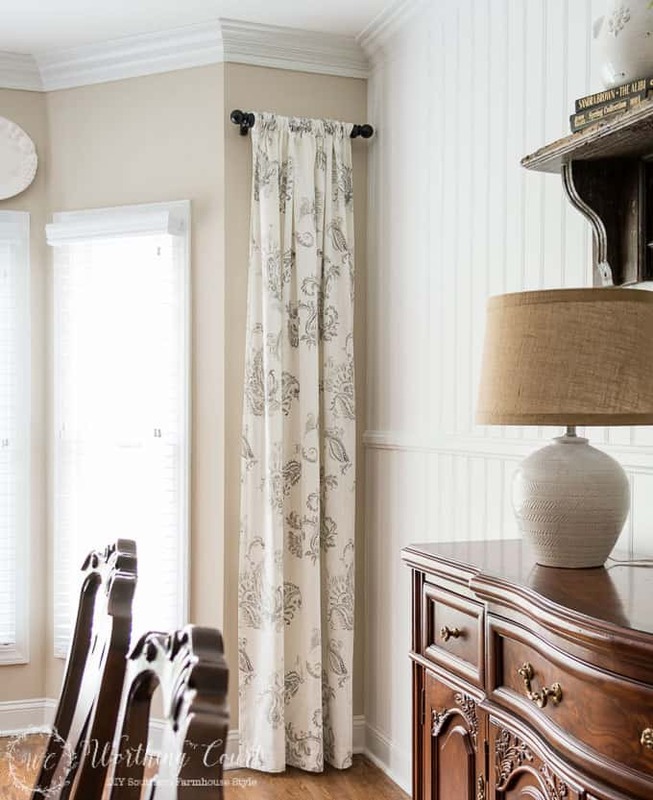 The first change was the addition of the drapery panels that I picked up at TJ Maxx quite a while back. I didn’t know where I would use them at the time. All I knew was that I loved the mix of light and dark gray and the design in the fabric. 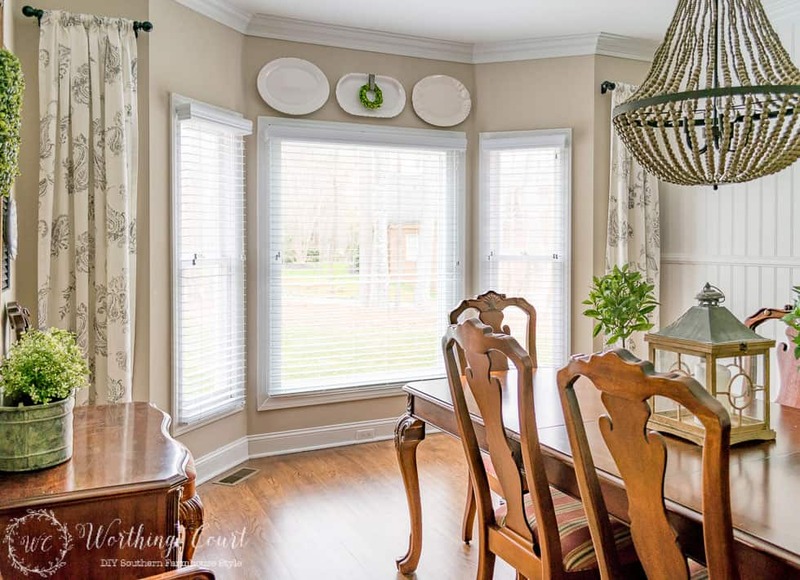 I had planned to use painted pvc pipe for the curtain rods and just purchase the finials and brackets that I needed, but it turned out to be less expensive to just purchase a set that included the rod. finials and brackets. It was easy to cut the rod down to the size that I needed. It had been my plan all along to hang them on either side of the bay window opening, instead of partially covering each of the side windows with a panel. This tends to be a dark room, even on the sunniest of days, so I didn’t want to do anything to block the light coming in. I’ve seen this done numerous times and have always loved the look, but I’ll admit that when I did it in my own home, it didn’t look quite right. Does that ever happen to you – you see something you love somewhere else and when you recreate it in your own space, it doesn’t look as good? Anyway, after living with it a few days and seeking the input of my daughter, we decided that what it needed was something above the middle window. I added a few platters that were previously hanging above my sideboard, before we installed the planked wall, and that is just what was needed to pull it all together. Did you see how we installed the planked wall in here? If you missed it, you really need to check it out. It’s the fastest and easiest planked wall ever! Click HERE to take a look at what we did. The other change that was made was above the small cherry chest. At first I was stumped about how to hang the plates from the shutters, but then I figured out that I could use regular clamp style plate hangers and run a piece of floral wire between the slats of the shutters to hold them in place. I moved the magnolia leaf wreath, that was hanging on the mirror, to my spring fireplace mantel and replaced it with a smaller boxwood one. This wreath fits the space much better. If you read my original post about the makeover plans for this room, you know that I was planning to paint this little chest. Now I’m undecided. Before these few changes, plus the addition of the white planked wall, this room was a sea of brown furniture and brown floors. The sea of brown has been broken up a bit and will be broken up even more once I find a fabric to recover the chairs with. So, now I’m hesitant. I mean, once it’s painted, it’s painted, ya know? I think I’ll recover the chairs first and then make a decision. 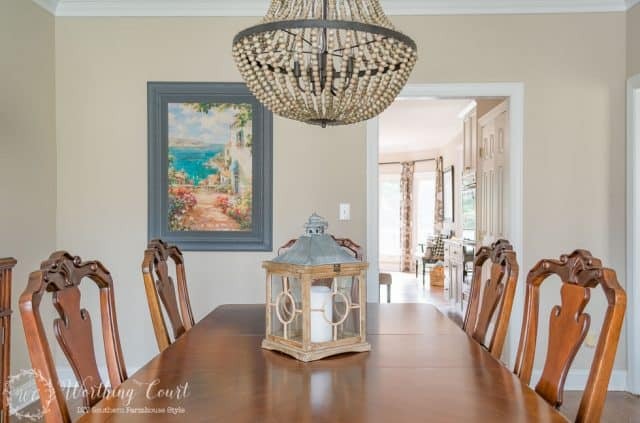 Other than recovering the chairs, I also have to make a decision about what to do on the wall that is to the left of the doorway to the kitchen. I thought that I would be putting a plate rack here, but now that I’ve added platters above the window and plates to the shutters above the chest, I don’t think that’s the right thing to do. It my mind, it would just be too many plates. So, I believe that I’m going to add a few botanical prints. I’ve narrowed it down to these two styles/colors. 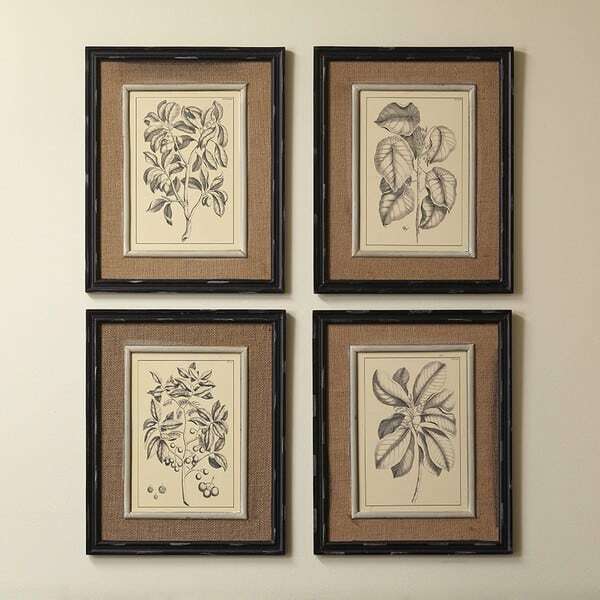 This grouping from Birchlane is nice and is large enough to fill up the wall. I think it’s a good price for four large prints that are already framed. 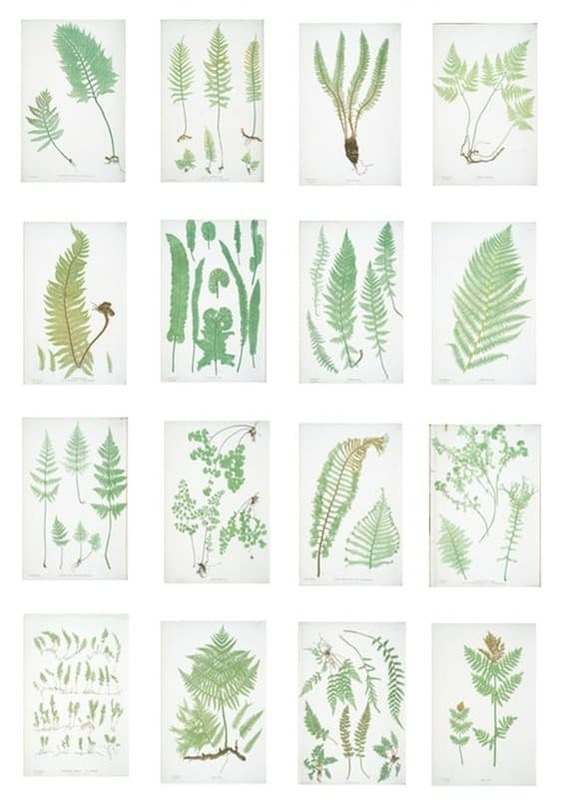 But, I also really like a grouping of framed fern prints. I think the addition of some color (besides the accessories) would keep the space fresh. Help me decide! Which choice do you like the best? As a little refresher, here are a couple of where we started shots and a couple of where we are now shots. Hard to judge just by looking at the photos, and you are the expert, not me-but I would not paint the small chest. I would paint the sideboard. Maybe blue, black, or neutral. Love the ferns, but if you plan to use al in the photo it might be too busy. Botanicals are lovely, too. Hi Ana. Actually, the sideboard is the piece that I would love to paint, but the hubs would not be happy about that one! Definitely the fern prints. It will go well with other pops of green. You will be back to the comfort of brown with the other choice. Hi Dawn. That’s what I was thinking about the ferns – it would tie in with the other pops of green and I’ll probably always have at least a little green in there. The romm looks great! It gave me a lot of inspiration! 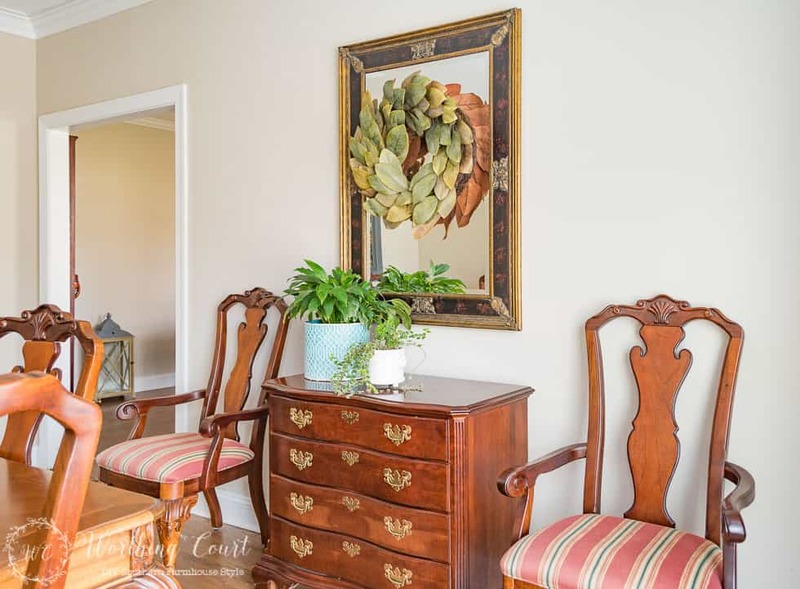 I would favor the fern prints. As you’ve said, you already have a lot of brown in the floors and furniture. The green would be fresh. Hi Teddee. I agree with you about the gray botanicals going with the drapery fabric. I’m so torn! Hi Donnamae. If I use the ferns, I wouldn’t use all of them. Just enough to fill the wall. Hopefully, the right answer about what to do with the chest will dawn on me once I’ve recovered the chairs. Your room is looking lovely! You have done some very nice work. I really like a the ferns since they look fresh and light in what you describe as a darker room. Maybe if small just use oversize mats and frames so not to overfill the wall? Plus sometimes I find it best to work on a room, then totally ignore it for a few weeks and get a fresh perspective. Too easy, at least for me, to keep tweaking and tweaking and then finding maybe I didnt need as much as I thought at the time…. Oh, you are SO right about that! I’ve learned the hard way, more than once, about what a mistake it is to rush through decorating a room. I always wind up wasting time and money when I do that. 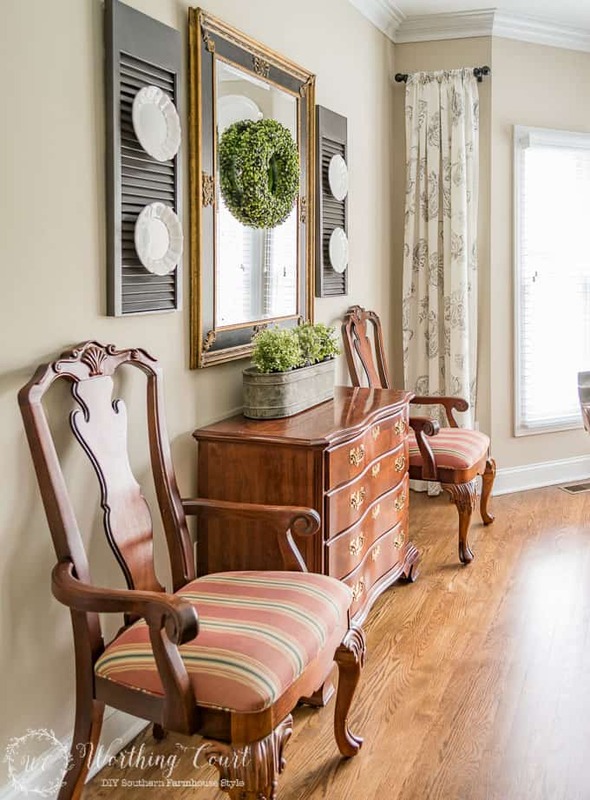 I would paint the little chest and choose the Birchlane set. If you love brown as much as I do, you’ll never tire of the brown prints. Amazing what the plates did to anchor the window wall, love the room. Please don’t paint that beautiful chest!! 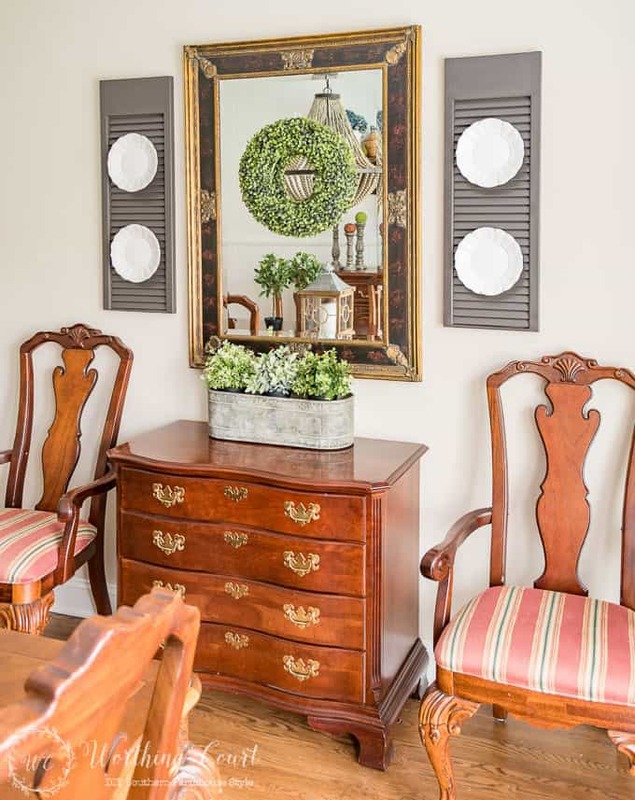 What about a mirror, flanked by two of the fern prints i.e. mirror on one side 2 statcked botanicals on the other.? 1)You said it is a dark room and 2) everything else seems symmetrical so far. Great progress! You seem so indecisive so trust your first instincts. 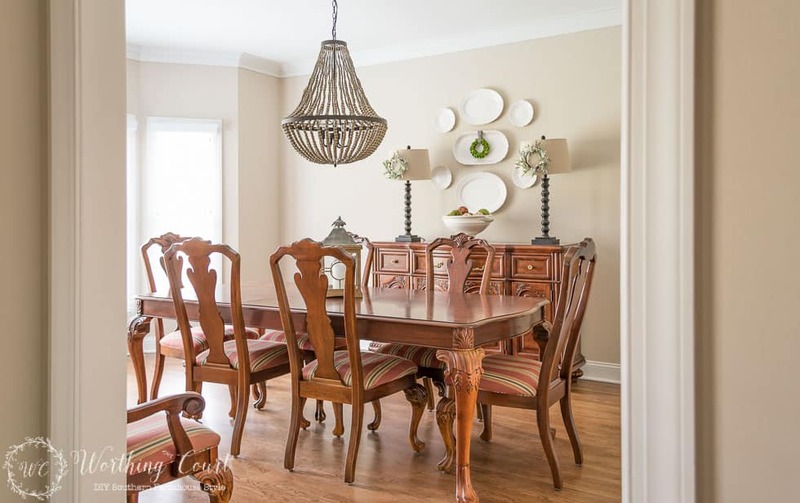 I have been an antique dealer for many years and everyone in the business said the same thing, “Don’t paint wood furniture.” That stopped me for a long time. Then, I just decided I needed a fresh start. I sold my house and all my antique furniture at an estate sale. But the deal fell through at the closing. I was left with my old house and no furniture. I bought gently used furniture and painted or refinished most of it. Guess what, a blessing in disguise. I no longer have to look at any more (brown) furniture. My house feels so fresh and modern. My family and friends love it. It took me about six months but I am happy. Oh, no, don’t paint the chest! It’s so beautiful with the chairs and mirror! Your room is turning out lovely. Thank you for sharing and the inspiration. 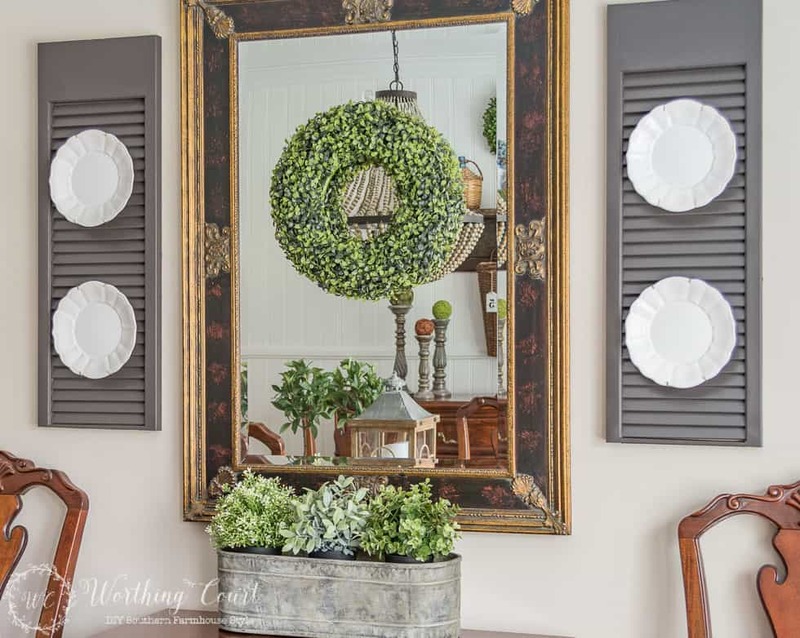 Suzy, May I ask how you hang the wreaths on the mirror? Hi Laurie. I used a Command Strip to hang the wreath. They make some that have a clear adhesive strip and that’s what I used. I love those things and use them everywhere! Do what you want with the chest. The room looks great! This is really taking shape! I like the fern prints. You have done some very nice work. I love your photos your room is wonderful and the white platters above the window are wonderful. I too think the addition of the green ferns would be a great addition!! Thanks for stopping by to share this week and the #OMHGFF, appreciate your visit!! Beautiful room – the plank wall is perfect. I love it all. Thanks for linking up to us on Throwback Thursday! I have a small chest just like yours. As much as I love painting furniture, I probably won’t paint mine.